UPDATE, Oct 22. 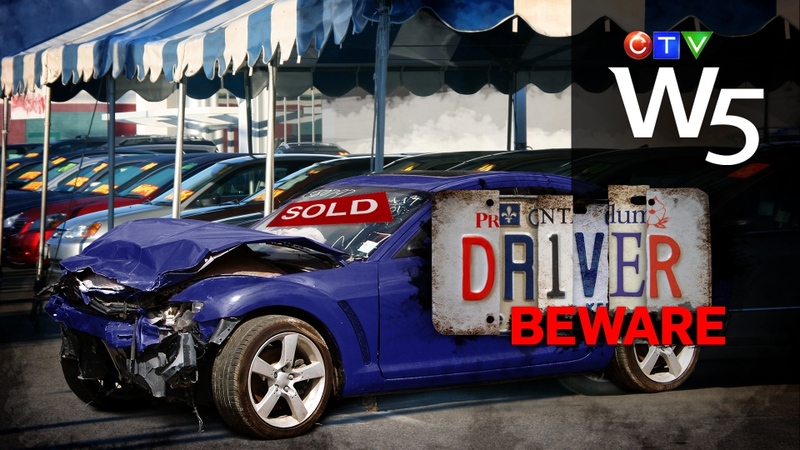 2015: Another group featured in W5’s investigation has been convicted of curbsiding - selling cars illegally through an unlicensed dealership – by OMVIC, Ontario’s car sales regulator. In W5’s hidden camera investigation with the APA – a car that was presented in good condition and as a private sale was actually linked to Monterey Auto Repair – the owner of which had previously been convicted and fined for curbsiding. W5 also discovered the car had been in fact a total write off after a previous accident. In addition to the conviction for curbsiding, the group was also convicted of engaging in an unfair business practice for selling cars that had been written off and rebuilt after accidents without disclosing the cars’ true history to purchasers. The total fine amount for the convicted parties was $54,500 plus a 25% victim fine surcharge – to be paid within 12 months. This year, APA’s secret shoppers and their expert mechanic looked for a decent used car in an ad and then visited the dealership or private seller to listen to the sales pitch and inspect the cars up close. The APA surveyed 21 car sellers in the Toronto area and turned up everything from dealers who added extra fees to their advertised price, to dealers who misrepresented a car’s accident history and even dealers who misrepresented themselves, as private individuals selling their personal vehicles. However, as W5 watched through our hidden cameras, we discovered a serious safety problem: rebuilt cars that the APA says were so poorly repaired after an accident that they should have never passed a government approved structural inspection. “I don’t think there was one that we shopped that was properly rebuilt,” said APA President George Iny. In Ontario, if a car is rebuilt after an accident, it must pass structural and mechanical safety inspections in order to ensure the car has been rebuilt properly and is safe to go back on the road. “Some of the cars we saw never should have been put back on the road,” said Iny. One car in particular stood out -- a 2012 Mazda 3 for sale at Toronto Used Cars. The salesman admitted that the car had been in an accident but claimed it was only cosmetic damage and that there was “no frame damage”. He even showed the shoppers a photo showing only minor damage to the car. There was just one problem: the photo he showed as his proof was a photo of a completely different car. W5 tracked down the car’s real accident photos and the damage was much worse than the salesman claimed. The car did indeed have frame damage and what’s worse, the repairs were substandard according to the APA. Iny told W5 the car had been “repaired by a butcher and (inspected) by somebody with bad eyesight”. “When (our mechanic) drove it, it pulled hard to the left, we suspect it’s still bent,” said Iny. Mechanic Nick Lagoudis also inspected the car and found a litany of other problems, that according to the MTO, most of which wouldn’t be addressed in the structural inspection: the dashboard was coming loose, each wheel was missing a lug nut and not fully secured to the car, the ground wiring had been installed improperly and was a potential fire hazard, the oil pan had been badly dented in the impact. With the car up on a hoist Lagoudis found that the power steering hoses were improperly secured; attached with a plastic tie wrap rather than a metal bracket. Lagoudis noted that if that plastic tie wrap holding the power steering hoses broke, it could cause further problems. “You (would) have no steering to drive the car”. In fact, the APA says that power steering could fail even sooner, within weeks, due to an active power steering fluid leak. The Mazda would also have to go through a second, mechanical safety inspection, before being sold, but the car had not yet had that inspection. However, according to the MTO, many of these issues would not be addressed in that subsequent inspection. Initially, Ontario Transportation Minister Glen Murray’s office declined W5’s request for an interview about the APA’s findings but when W5 confronted him at the Ontario legislature he readily acknowledged that the sale of unsafe rebuilt cars is a problem. In March 2014, the government introduced new legislation that Murray believes will remedy many of the issues raised by the APA survey. According to Murray, the new bill will “substantively improve enforcement and inspections” and that they will “be engaging a third party with a very specific contact for more rigorous enforcement”. This year, the APA’s survey of used car sales reached a new low: out of the 21 used car sellers they surveyed – only two passed, the other 19 failed their survey. By the numbers, this is the worst result the APA has seen in the time they have been testing used car sales. However, the vehicles at many dealerships appeared to be in better overall condition this year than in previous investigations in the Toronto market. And, used car dealers as a group, offered more professional vehicle presentations than in other years. The APA found dealers charging up to $695 for safety and emissions testing, although some said they would let the shoppers take it elsewhere for that testing. “APA’s position is that all-in is all-in,” said Iny. His advice to consumers is to raise the issue and try to negotiate a larger discount or remove the fees. 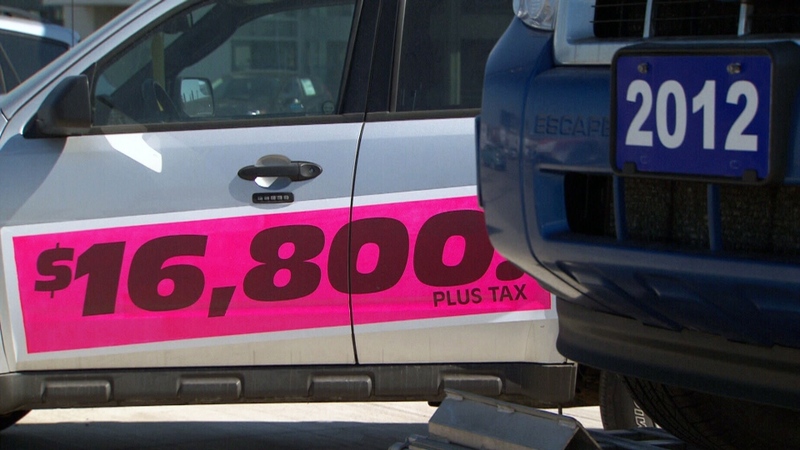 He also advises that if you are certain the charge is prohibited, you should report the incident to the Ontario Motor Vehicle Industry Council (OMVIC) along with a copy of the dealer’s advertising and any other paperwork you may have obtained regarding the price. The APA found that Auto Select had a good selection of well-priced cars -- and those prices were all-in. During the APA’s visit, the salesman had no problem letting the shoppers take the car for a pre-purchase inspection. At Good Fellow’s, the APA reported that the salesperson was knowledgeable about his cars and gave good advice on which cars would be the best value for the shoppers. He also had the accident history on hand to tell shoppers about the condition of the cars and pointed out which cars were former rentals. Good Fellow’s also allowed the shoppers to take the car for a pre-purchase inspection, providing they left a deposit, and their advertised price was all-in including safety and emissions testing. The APA’s George Iny noted that recently Good Fellow’s was disciplined by OMVIC, over disclosure and marketing issues, and was required to send its sales staff for training. “Perhaps that experience contributed to this year’s good result,” said Iny. W5 examines the Canadian car industry. W5 teams up with the Automobile Protection Association (APA) to examine the Canadian car industry.